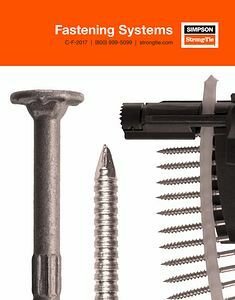 The 2017 Fastening Systems catalog contains Simpson Strong-Tie fastener solutions such as our Strong-Drive®, Deck-Drive™, Quik Drive® and stainless-steel product lines. This piece provides product information, features, benefits, product model numbers, specifications and technical information (engineering load tables, spacing diagrams, installation instructions, etc.). Strong-Drive, Deck-Drive, Quik Drive - Engineered to drive easy.